Why Doesn't Washing Powder Dissolve in My Washing Machine? Problems with laundry detergents not producing suds in the washing machine usually have to do with the water quality. Water that's too hard fails to produce the suds needed to effectively penetrate fabrics and clean laundry. Certain laundry detergents, like high-efficiency (HE) products, are intentionally designed to create fewer suds than conventional detergents to accommodate front-loading washing machines that use less water. 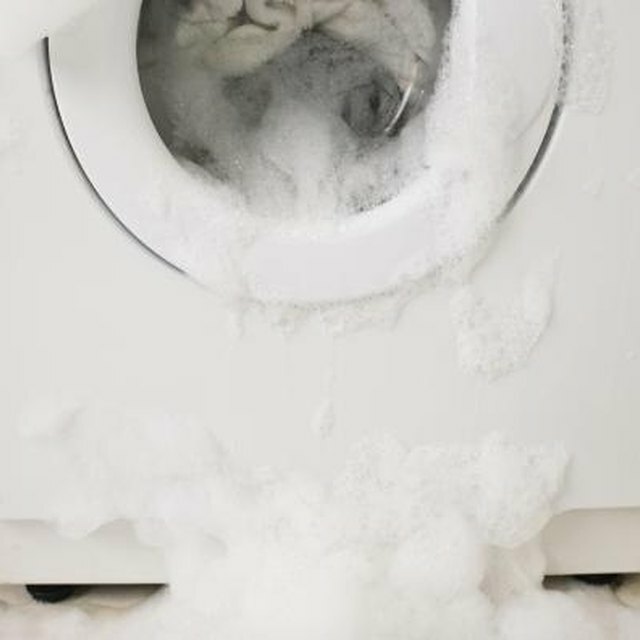 If you're experiencing issues with a detergent producing no or little suds, there are ways you can remedy it. Suds pass through and deep-clean fabrics washed in a washing machine. The water quality in your home impacts the effectiveness of detergents. In general, soft water dissolves detergent faster than hard water, so perhaps a certain amount of detergent isn't dissolving in your wash load, resulting in fewer suds. Soft water also requires less detergent to produce the same amount of suds for the same size load of laundry compared to hard water, which often needs more detergent. Try increasing the amount of detergent you use per wash load by about 1/4 of the amount the manufacturer suggests. Using more laundry detergent might lead to more suds. The water temperature can impact the interaction the detergent has with water. If the water temperature is below 86 degrees F, use predissolved liquid detergent in your washing machine, not tablets or powder. Tablets and powder are best used when washing laundry in hot water with water temperatures of at least 86 degrees F. It's at this temperature that tablets and powder can combine with water and produce suds. Always follow the manufacturer's recommendations for product use to ensure suds form. The manufacturer typically lists the detergent quantities to use based on load size. Don't deviate too much from these prescribed guidelines to achieve the best results. If you use less detergent than the amount specified on the packaging, you're liable to have fewer suds than desired. Avoid filling the washing machine with too much laundry. Detergent needs room to mix with water to produce suds to clean clothes. When too many items are in the machine at one time, the detergent doesn't dissolve and combine with water properly and consequently won't suds up. Remove excess items from the machine. Avoid washing bulky items, such as bedspreads, in the household washing machine and instead take them to a dry cleaner to wash in an industrial size machine that can better accommodate bigger items. Put detergent in first, and turn the water on to give time for them to integrate before filling the washer with laundry. HE laundry detergents are engineered to produce fewer suds than regular detergents. They were specifically developed for front-loading washing machines that use less water than conventional top-loading machines. If you use a HE detergent in a typical top-loading washing machine, expect to see fewer suds. Only use HE detergents in energy-efficient washing machines.